This Loft Bed is just simple modern design crafted to suit your contemporary style home. 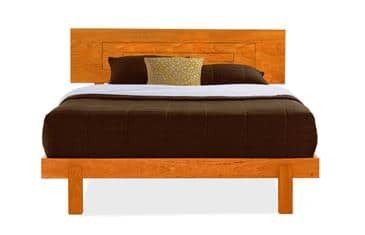 This bed features solid sustainably harvested cherry wood, traditional joinery and an eco-friendly, hand applied oil finish. Expertly crafted in Vermont and easy to customize in your choice of size and hardwood. Vermont Furniture Designs strives to build the most beautiful and durable furniture possible. We believe that the outside of the furniture should appear as if built with traditional techniques, with an emphasis on color and grain selection and matching boards. Inside, we apply the technology that is most appropriate for the use in question-the most up-to-date parts and the strongest and smoothest operating slides and hardware. Those parts that are not visible are chosen because they do the absolute best job in the application. They make parts in multiples, but each piece of furniture is bench-crafted by a small team of Vermont Craftsmen. Everyone on their team is a quality-control person, and parts and furniture can be rejected at any time. This results in an old-world look with a high degree of quality and durability.